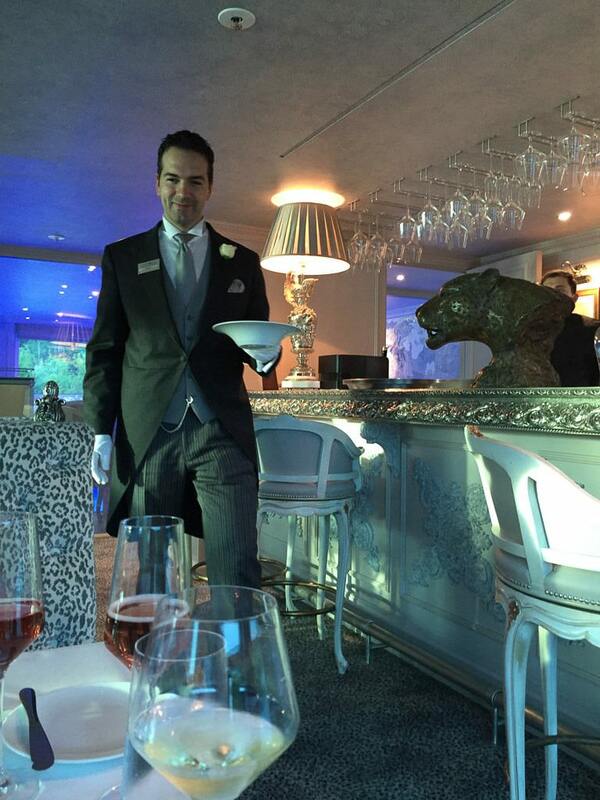 Last night, I had an incredible dining experience in my favorite public room on S.S. Maria Theresa, the Leopard Bar. What surprised me was the elegance of the dinner. White-gloved, tuxedoed waiters served us dishes that were as nice to look at as they were to consume. 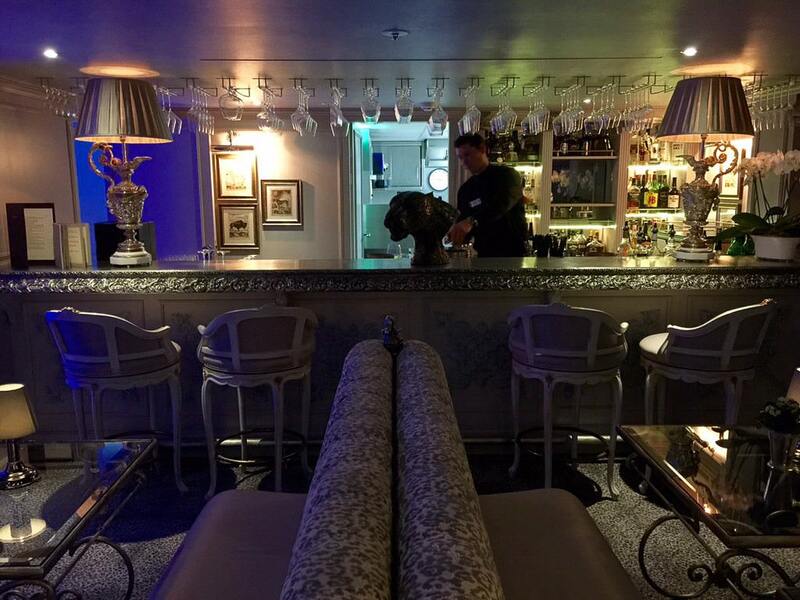 The aft-situated bar transforms into a private-dining restaurant capable of serving up to 20 guests on select evenings during each sailing. 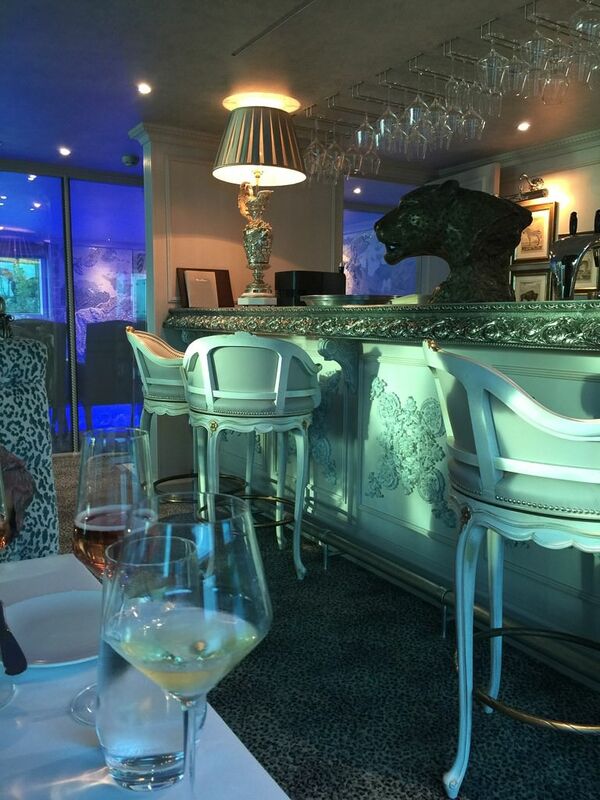 Dinner in the Leopard Bar is complimentary, though reservations-only. The main restaurant, which also offers excellent an dining experience during dinner (as well as breakfast and lunch), is open-seating. During the day in the Leopard Bar, guests may also order from a Bistro Menu, with items ranging from a “Uniworld Club Sandwich” to local specialities such as “Homemade Hungarian Style Goulash Soup” and “Regional Smoked Sausages.” On the sweet side, the menu offers choices of “White Chocolate Brownies” and a variety of ice cream desserts. There are also fruit and cheese selections, teas and coffees and more. 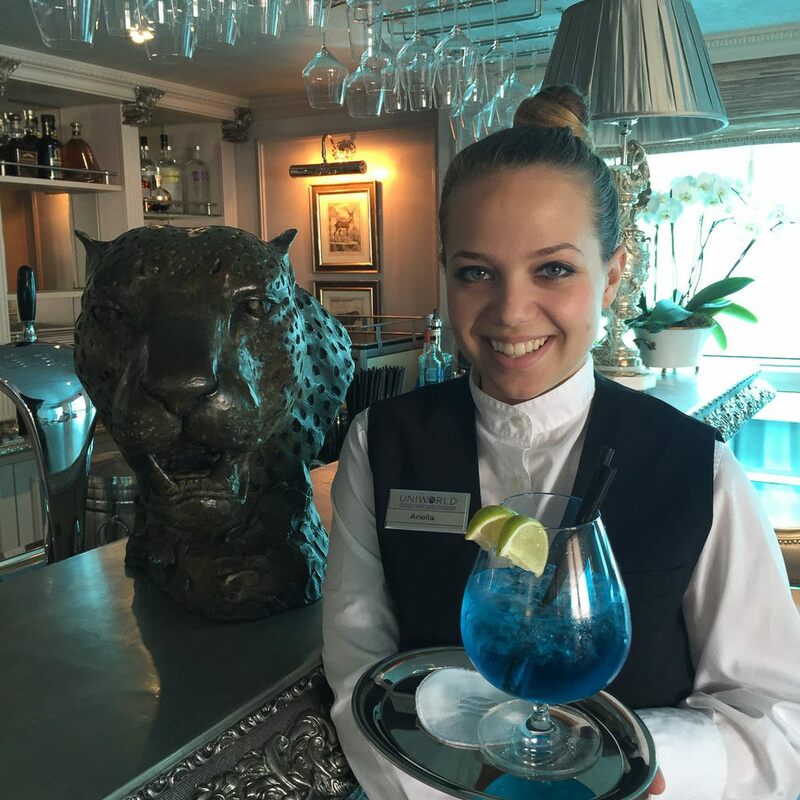 A “Lite Lunch” is also served in the Leopard Bar and typically includes fresh salads and soups, pasta of the day and assorted sweets. Before telling you about the dinner, I’d like to familiarize you with the Leopard Bar. First, why the name? It is odd isn’t it, particularly given the fact that there are no leopards on the Danube, where we’re sailing now, or on the other rivers in Europe. However, there are leopards in South Africa, home of the Tollman family, the founders of Uniworld. The Leopard Bar is a bit of a tribute to the Tollman’s homeland. 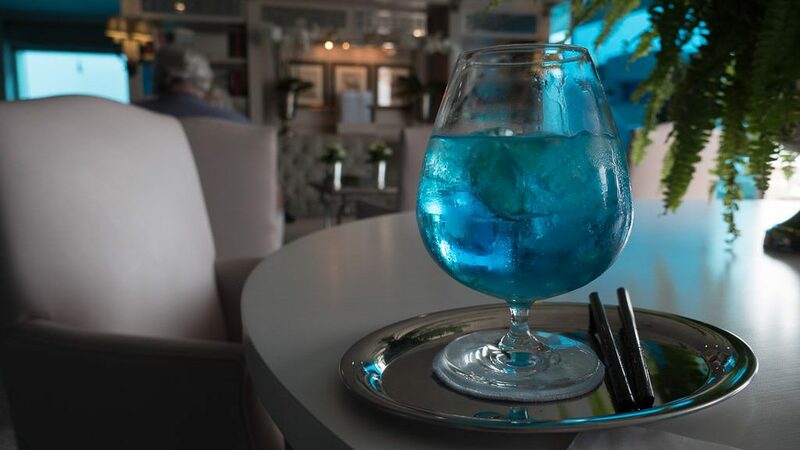 The room is absolutely gorgeous, with flowers and greenery, comfortable leather seating, books and games, a bar and open-air deck with four tables and chairs. The Leopard Bar also features one of the most unusual features I’ve ever seen on a river cruiser — an indoor pool. 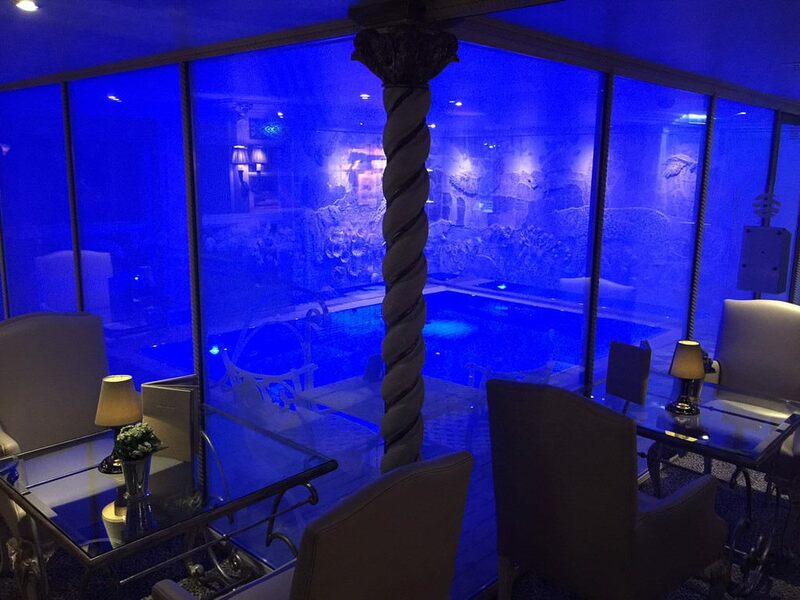 It’s not the only indoor pool I’ve seen on a river vessel — Uniworld’s S.S. Catherine has the same feature in its Leopard Bar, and Peter Deilmann’s Mozart featured an indoor pool when I sailed her many years ago — but a pool is something you don’t necessarily expect in a bar. Still, it adds an interesting touch to this cozy room. 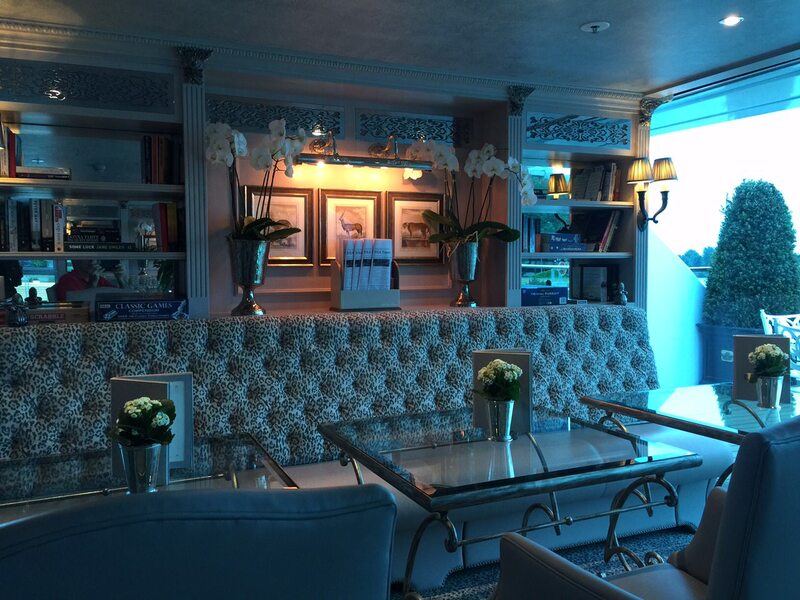 I was so busy enjoying the sunny days when we were sailing that I forgot to shoot a photo of the open-air aft area in the Leopard Bar. So all I have to give to you is a photo on an overcast day in Vienna. The open-air area was a great place to enjoy the river on the sunny days when we were cruising. 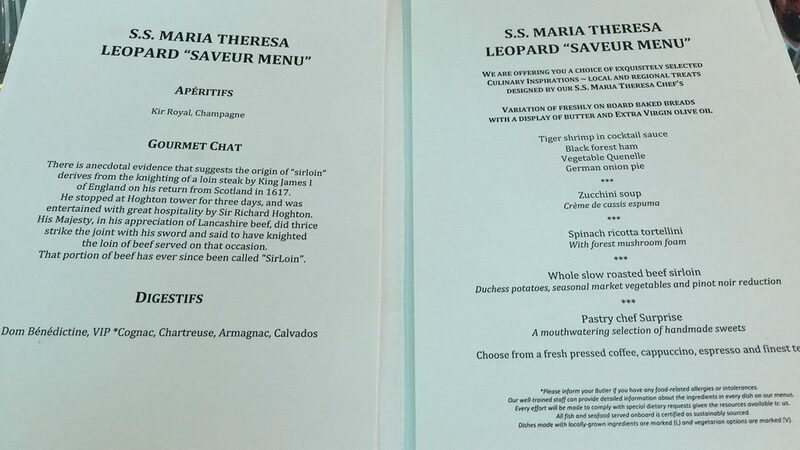 At 7 p.m. last night, we sauntered to the Leopard Bar for our dinner. 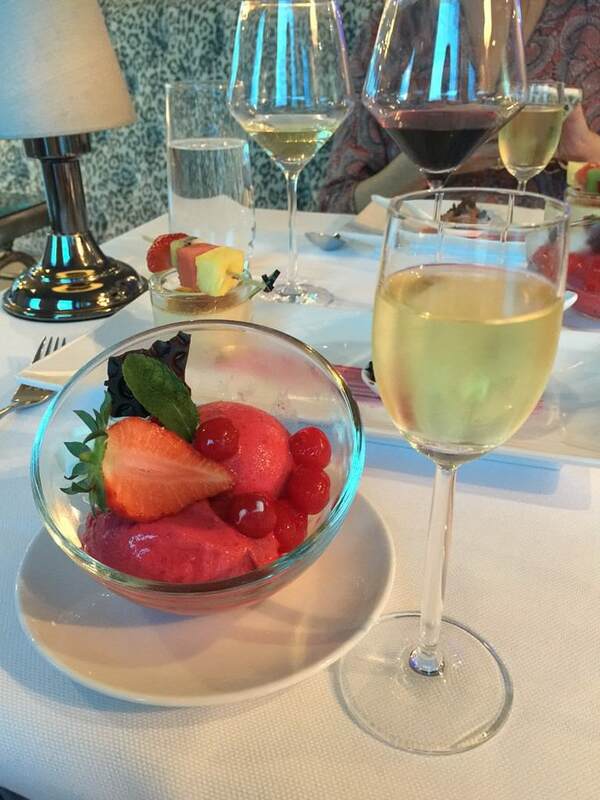 The five courses were elegantly served by the extremely friendly and professional staff that defines Uniworld, and the cuisine was delicious. We were welcomed with a Kir Royale and presented the “Saveur Menu.” The beef was among the most succulent that I’ve ever had. Here’s our evening, in photos. 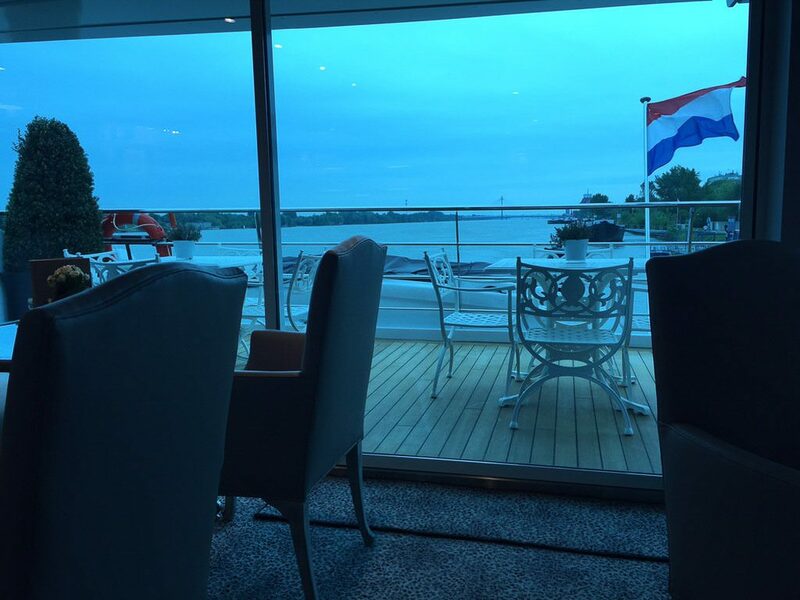 We were lucky enough to enjoy the Saveur Dinner on the River Baroness in March. It was a very special night, as we cruised down the Seine with others we befriended on the ship. And, thanks for clarifying that the glass to the pool can be made opaque, for privacy purposes. I mentioned to our hotel director on the Baroness that it was really odd to have a pool in that location. I couldn’t imagine anyone wanting to be “on display” to those in the bar. But, do you have to walk through the bar to get to the pool? You don’t have to walk past the bar, but you do enter the Leopard Bar, so folks would see you going into the pool area. Wear one of the soft long bathrobes. I think you could do it with a fair degree of privacy.